Nickel is the chemical element with atomic number 28 on the periodic table with element symbol Ni. Its standard atomic weight is 58.6934 and its electron configuration is [Ar] 3d8 4s2 . It is a shiny silver transition metal that develops a slight yellow tinge upon exposure to air. Nickel is known for its use in stainless steel, batteries, and plating. Here is a collection of facts about the element. 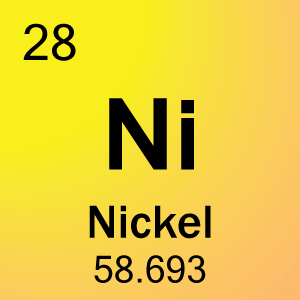 Nickel is atomic number 28 with element symbol Ni. Nickel is a hard, ductile solid at room temperature. Like other transition metals, it has high melting and boiling points, high density, and conducts electricity. Its melting point is 1728 K ​(1455 °C, ​2651 °F) and its boiling point is 3003 K ​(2730 °C, ​4946 °F). Its density near room temperature is 8.908 g/cm3. Nickel gets its name from the German word kupfernickel, which means Old Nick’s copper or Devil’s copper. This is because miners would think the reddish nickel ore with flecks of green (kupfernickel or nickel arsenide) was valuable copper ore, but they would obtain no copper from it upon smelting. 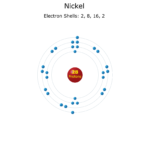 Nickel was discovered and first isolated by Axel Fredrik Cronstedt in 1751. In nature, nickel consists of five stable isotopes: Ni-58, Ni-60, Ni-61, Ni-62, and Ni-64. 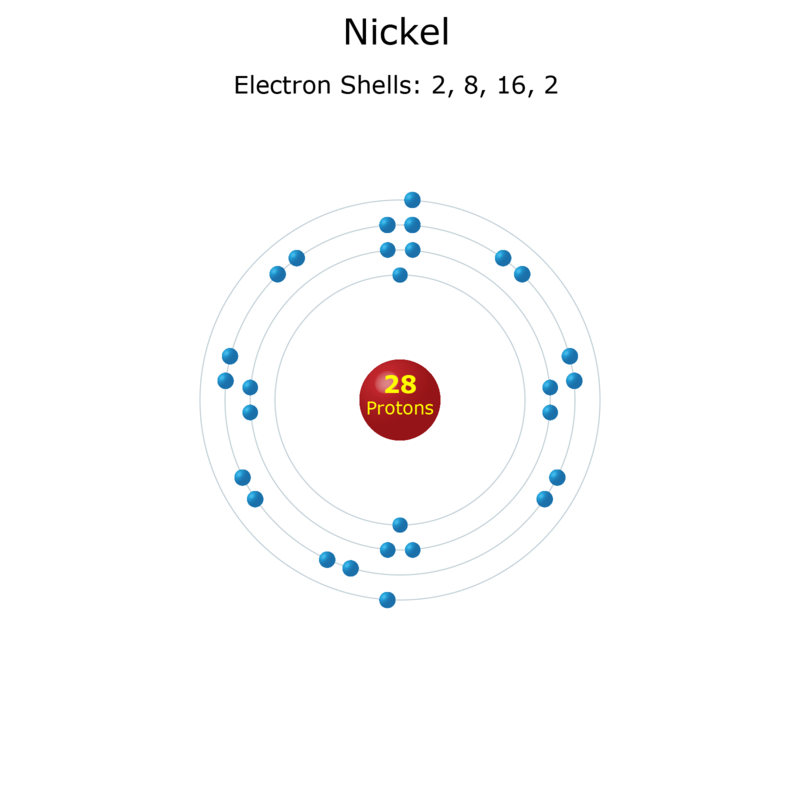 The most abundant isotope is nickel-58, which accounts for over 68% of the element. Other isotopes range from Ni-48 to Ni-78. The most stable radioisotope is nickel-59, which has a half-life of 76000 years. The most common oxidation state of nickel is +2. The neutral atom, +1, and +3 states are also common. Other oxidation states also occur, including -1, -2, and +4. Nickel complexes are uncommon, but they are colored in aqueous solutions (a hallmark of transition metals). 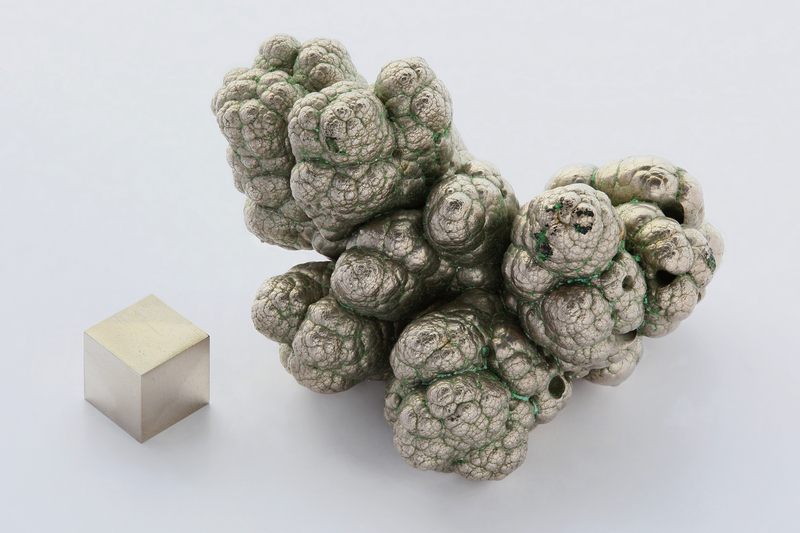 Nickel is one of four elements that are ferromagnetic at room temperature. The other elements are iron, cobalt, and gadolinium. Prior to the invention of rare earth magnets, Alnico magnets made from aluminum and nickel were the strongest permanent magnets. Alnico magnets are unusual because they remain magnetic even at red-hot temperatures. Nickel is the primary element in Mu metal. Mu metal is an alloy of nickel, iron, and molybdenum that shields magnetic fields. Although nickel is an essential nutrient for plants, it is carcinogenic in humans. Inhaling nickel compounds causes chronic bronchitis and lung cancer. Between 10 and 20% of people are sensitive to nickel and suffer dermatitis from skin contact with the metal. Nickel has many uses. Its principal commercial value is for stainless steel and other corrosion-resistant alloys. When added to glass, nickel imparts a green color. Fine nickel powder is a catalyst in vegetable oil hydrogenation. Nickel is an important component of batteries. Nickel is an important metal for making coins. Ironically, the Canadian nickel is made of steel. The American nickel is 75% copper and only 25% nickel. Nickel usually occurs with iron or sulfur, but it is also found in pure form. 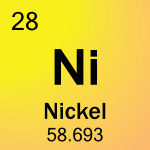 While nickel is the 5th most abundant element on Earth, it is only the 22nd most abundant element in the crust. Most of the element is found in the mantle and core. Many meteorites contain a nickel-iron alloy. Artifacts from this alloy were made as early as 5000 BC. The primary nickel ores are pentlandite and pyrrhotite. Major ore deposits are found in Canada, Australia, Indonesia, and Cuba.